I fell in love with young girl's beautiful Asian face. --then went to work on the mixed media canvas. creating a first draft and the revising until I can see a personality. In the process, a Spanish senorita appeared! I love how she "evolved" through the creative process. Hope you do as well! Kim Caldwell's An Enchanted Affaire. Extrememly disappointed, I rested, laid low and finally this morning, felt up to leaving the house. Only one place to go--my "Artist's Respite". Where Nature's beauty recharges my soul. I feel like I am miles away from the city --yet I'm moments from my home. all within a five minute time frame. As I head back, I discover three floral arches created by the yuccas. Feeling much better, creatively recharged, and physically restored. Wow--can't even believe its February. I am behind in blogging--so my quick update is that I've been journaling, layering, playing--and loving it! I'll be blogging more about my process, inspirations (as well as distractions!) in the near future. In the meantime, Happy February! One of my favorite journal techniques I've learned this year? Working on several journals simultaneously. When I first heard this concept, I recall scratching my head and making the Scooby-Doo noise --mmrph? 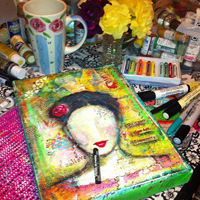 my brush, my stencils, my stamps --on empty journal pages. Sometimes "Wiping Out" creates an entire piece of art on its own. to cover up old notes and clean my stamps. with interesting and unexpected backgrounds.